TBILISI, DFWatch–Bus drivers demonstrated in many Georgian towns on Tuesday, as a response to one of their colleagues who died on the job in Tbilisi following a fight with a passenger. At 14:00, drivers stopped their bus or minibus and let the vehicle’s horn cry out for one minute in Tbilisi, Poti, Batumi, Gori, Rustavi and other towns. The Georgian Transport Trade Unions organized the protest, and the reasons is the death of Valeri Esvanjia in the Tbilisi district Ponichala on July 17, which they feel has not been sufficiently reacted to. Drivers want tough punishment for the passenger who attacked the driver. They are dissatisfied with the fact that a suspect who was detained the day after the incident was released the next day. Lavrenti Alania, head of the union, said at a press conference on Monday that this was far from an isolated incident of a driver being harassed and attacked. On Wednesday, the union plans to publish statistics of all the attacks and violence against drivers. The same day, they plan protest rallies at the place where the attack happened. Later, the drivers plan to bring the documents to the Ministry of Internal Affairs and show them list of attacks on drivers for the last six months, reminding officials that none of the attackers have been punished. Police on Saturday detained a suspect for deliberately damaging the health of another person. The investigation is launched on the basis of section 117 of the criminal code, about deliberately damaging the health of another person, resulting in death. Tbilisi City Court let the suspect out on 7,000 lari (USD 4,000) bail. 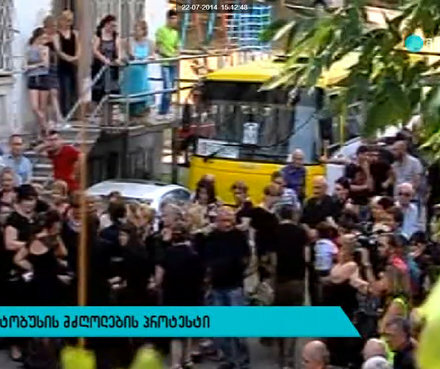 Esvanjia’s funeral took place on Tuesday.